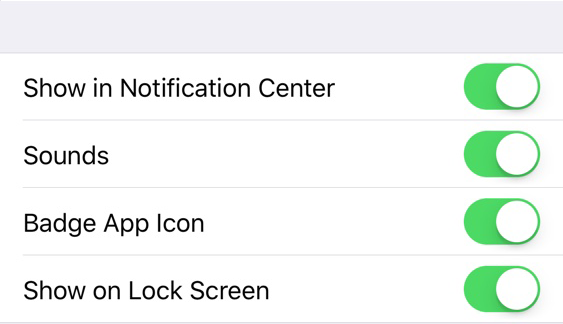 Before we dive into how notifications work, it's important to know that regardless of all the settings below, you won't receive any notifications if the app is open on your screen. This option acts as the master switch for your notifications. When disabled, the rest of the options in this screen will disappear- since you won't have any notifications to adjust the settings for. Think of it as your main on/off switch. Notifications wake up device: Enabling this option means that any push notification you get will wake up your mobile app, lighting up the screen and displaying the notification. Disable notifications light: Turning on this option will prevent your notification light from turning on if you get a notification. Disable notifications vibration: Turning on this option will disable any notifications from triggering your mobile device's vibration function. New message sound: In the works! You'll be able to upload your own custom sound to play when you receive a notification! Or.. Disable sounds: .. Or disable them entirely, by selecting this option. This'll bring up the server notifications menu. There's 3 sections of selections here as well. Only @ mentions: This option means only @everyone or @here mentions that include you will trigger notifications. 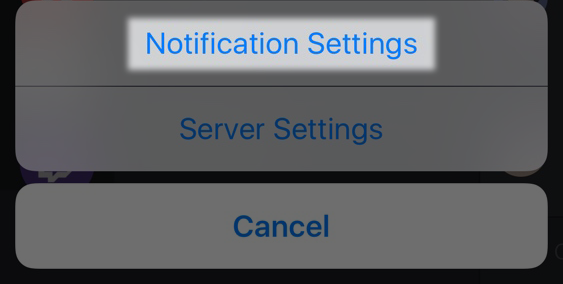 Nothing: This option means no notifications will be pushed to your phone, but you'll still get the server notification marker. 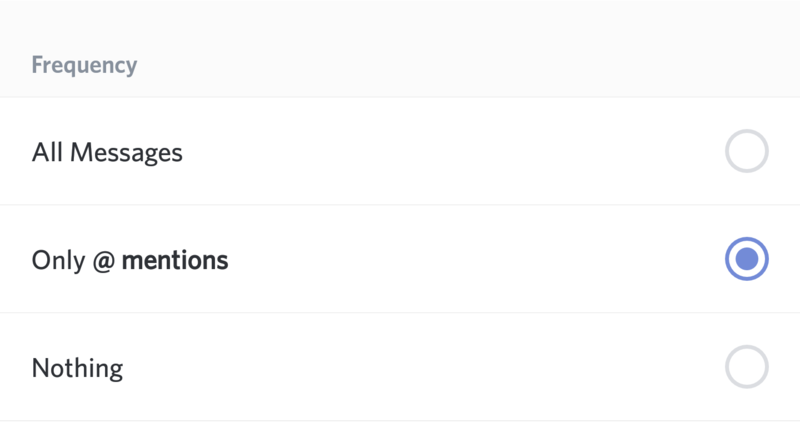 Suppress @ everyone: Selecting this option will mean you can still get normal notifications for @mentions or as listed in your frequency section, but you won't get notified anytime someone drops an @everyone or @here. Mobile Push Notifications: This option will control whether or not notifications from this server come up as push notifications when the app isn't in focus. Similar to Android, this acts as your master notification control. Disabling this will mean Discord won't send any push/banner notifications when you receive a message in Discord. Show in Notification Center: This option will send Discord's notifications to the notification center menu along with other apps and notifications. Sounds: This option affects whether or not Discord notifications make an audible sound when received. Badge App Icon: Enabling this option means notifications and specific mentions (@mentions or DMs) will update with a red notification indicator over the app icon in your main menu. Show on Lock Screen: This option enabled will let Discord notifications come up on your lock screen before unlocking your device. Mute Server: As listed in the description, enabling this option will prevent unread indicators and notifications from appearing with the exception of mentions. All Messages: Any message posted in this server will trigger a notification according to your app notification settings listed in the first section. Only @mentions: The only messages that will trigger notifications are specific @mentions. 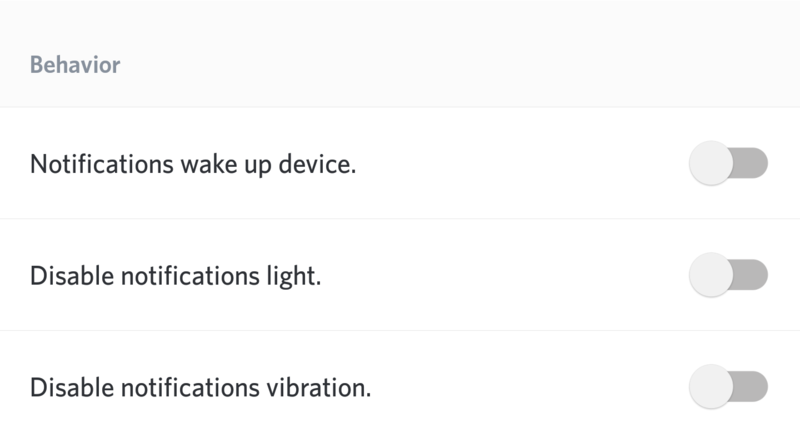 Nothing: No messages in this server will trigger device notification alerts. Suppress @everyone and @here: Enabling this option will prevent both types of @mentions from triggering notifications. Mobile Push Notifications: This option affects whether notifications from this server are sent as push notifications when triggered.